Since 2009, EvaluSys has enlisted the knowledge and practical experience of dozens of business experts to develop evaluation content reflecting critical management issues encountered with their clients. 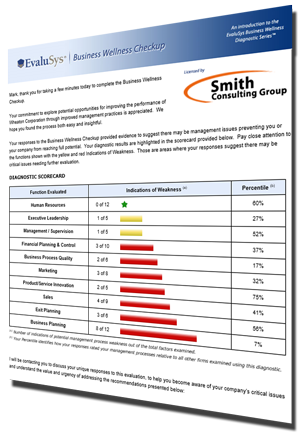 Use these evaluations to collect valuable insights driving business performance and enterprise value. Examines key management processes surrounding goal setting and the ability for the company to reliably achieve those goals. Examines key skills and behaviors common to highly effective business leaders. Examines key disciplines central to sound business financial management and financial risk management. Examines key practices and processes central to producing a robust and consistent flow of qualified prospects into a company's sales process. Examines key practices and processes central to effective leadership and direction of a sales organization and individual sales professionals. Examines key practices and processes central to maintaining a continual flow of new, innovative products and/or services. Examines a broad range of factors factors impacting your ability to achieve a stable and productive workforce for your business. Examines many key factors impacting the ability of your managers to maintain a happy and productive team. A valuable inspection of many key factors impacting your ability to establish and maintain reliable and efficient business processes within your company. Examines a multitude of factors influencing a successful business ownership transition, including essential preparations for both the business owner(s) and the company operations. A holistic introductory examination touching on key elements of each evaluation within the Business Wellness Diagnostic Series™. The Business Wellness Checkup will identify broad functional areas of management warranting a closer look, and is commonly used with new or prospective advisory clients as a means to "get acquainted". © EvaluSys LLC, Charlotte, NC USA. All rights reserved.